I've been on a blogging hiatus of late, since we snuck off for a little family vacation last week! Our vacation was more of an adventure than we'd anticipated, but it all worked out in the end. I'll fill you guys in on the details soon! It's hard to tell, but it was white porcelain with flowers painted onto it in pinks and greens and blues and golds. 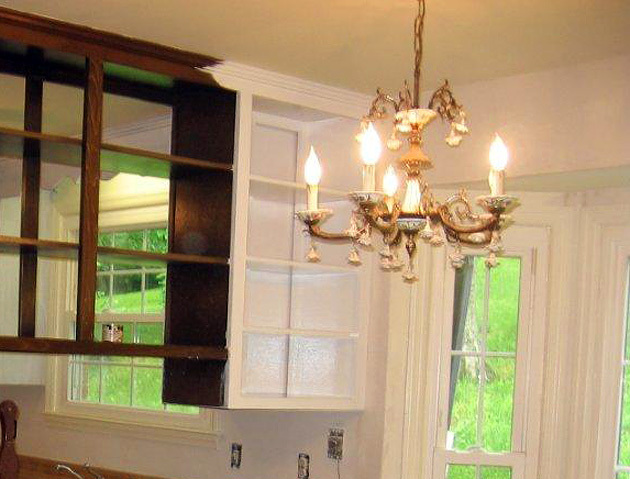 It was ornate and was probably very trendy when it was installed ... but it just wasn't doing it for us. One night when Ben's mom was hanging out at our house, she suggested taking off those dangling flowers ... so we plucked those off first. A few days later I realized I could unscrew all of the extra curly-cue looking pieces. 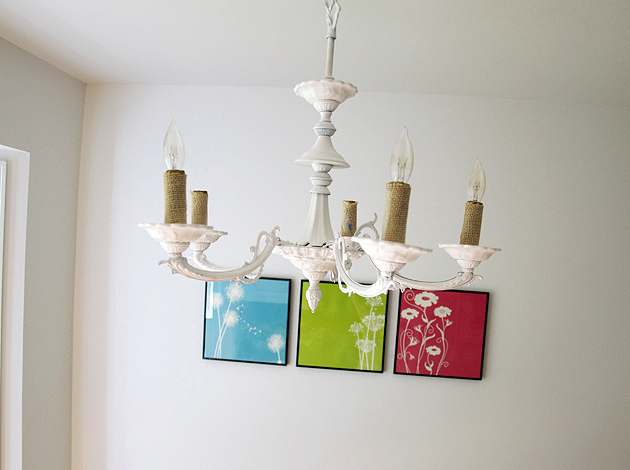 And once I stripped this poor chandelier down, it had a nice, classic shape to it. So I decided that before spending money on a new light fixture, I'd try painting this little lady. I had Ben help me take it out of the ceiling, hung it from a cord under our carport, and sprayed away - first with a little primer, then with a few coats of a matte white spray paint. I went right over the chain too. My inspiration? 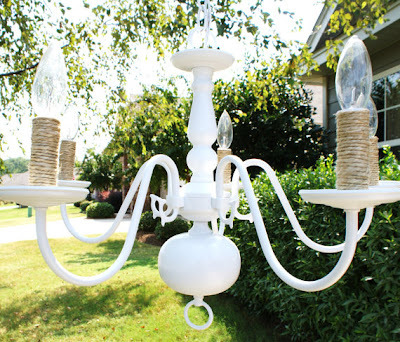 Etsy seller SimplySalvage, who made this gorgeous white-painted chandelier and wrapped the light switches with twine. 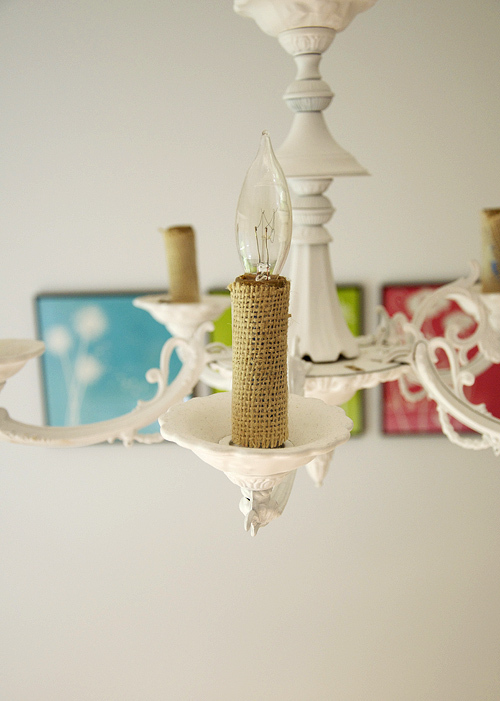 My chandelier had plastic covers around the base of each light bulb, so I was able to pop those right off and wrap a little burlap around each one. It was so simple - I used painters tape to secure the burlap, and pointed the seam inward so it's not visible. I was thrilled with my chandelier redo! 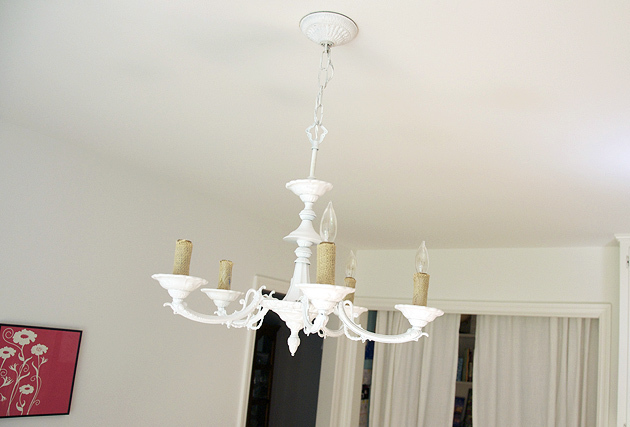 We figured our electrician could fix the problem easily, but now we're leaning toward just buying a new light fixture. Perhaps this little lady has seen her day. 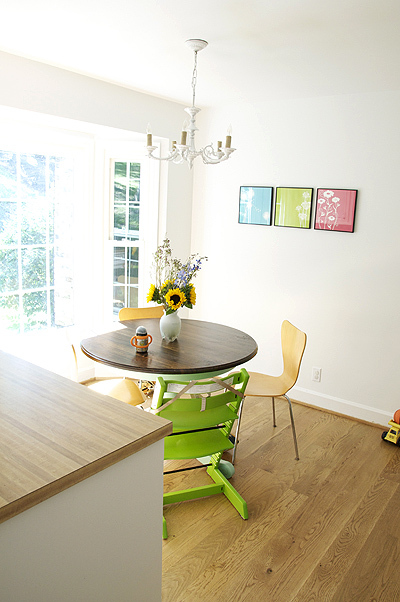 I've thought about a classic barn light like these beauties from Barn Light Electric, or maybe a basket light similar to the styles shown in this blog post over at My Life in the Burbs.